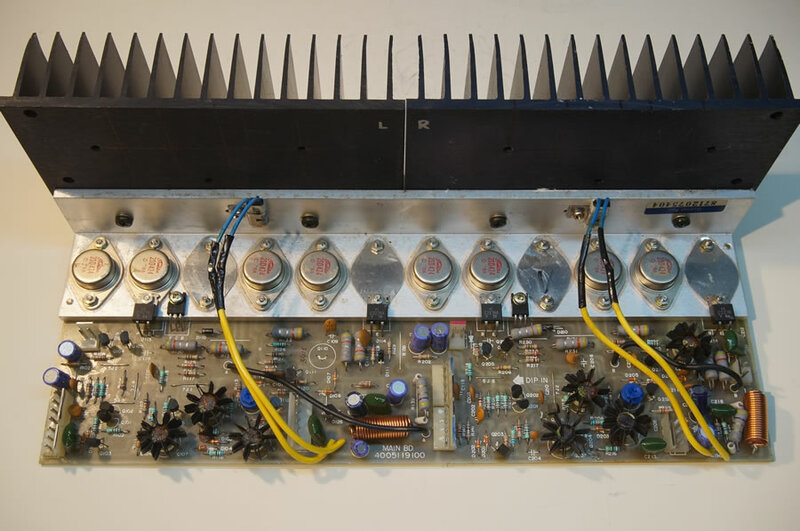 I bought this amplifier on eBay with the intention of restoring it. Upon removing the top, I discovered that it’s possibly the first version. All the power transistors are Toshiba 2SD424, which means it is a quasi-complementary design. I can easily get it up and running but it serves no purpose. I want to improve on it but I couldn’t find any AB schematic with a quasi output. Without it, it’s going to take quite a bit of my time to trace out the circuit. It’s something I’m not too keen on. After pondering over it, I decided it’s more productive if I simply recycle whatever parts that I can use and retrofit one of amplifier kits. 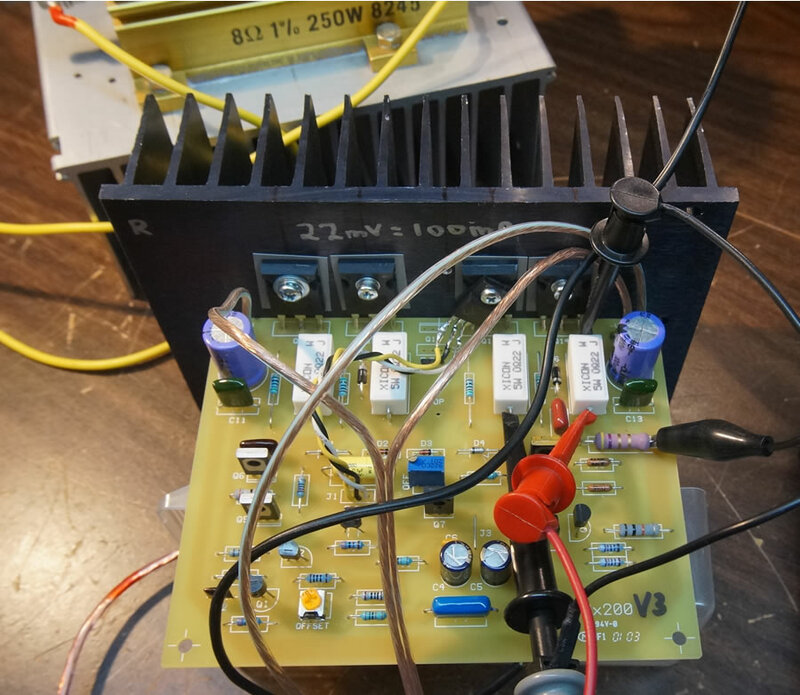 It just so happens that the power transformer is 49-0-49Vac, which is perfect for my 300 Watts Hx200mk2 Mosfet kit. Space is not an issue too. I can even mount the Hx200mk2 over the original Precedent 400 circuit board. 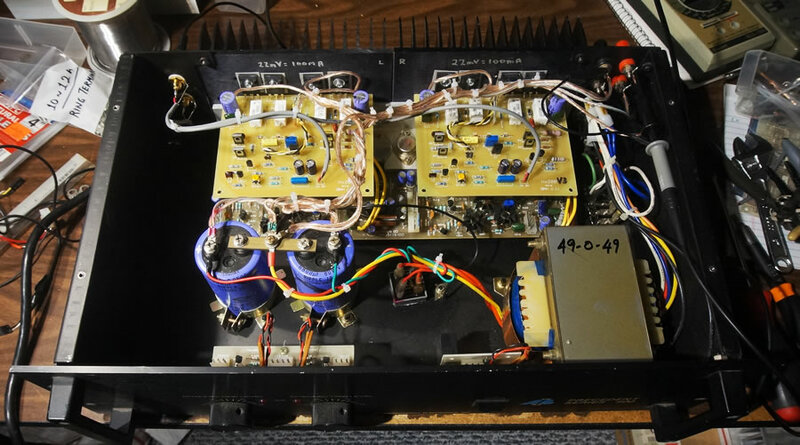 Detaching the amplifier module is easy enough. Remove a few screws and the entire module can be lifted off the chassis. On closer examination, it is obvious that the faulty components are all the TO-39 transistors. They are badly oxidized and a dark brown substance seems to have oozed out of them. With the old pc board out of the way, I then drilled and tapped the holes for the power mosfets. The picture below is a fully assembled Hx200mk2 during bench testing. I adjusted the bias for 100mA per mosfet, so the heatsink is nice and warm. Thermal stability is rock solid. 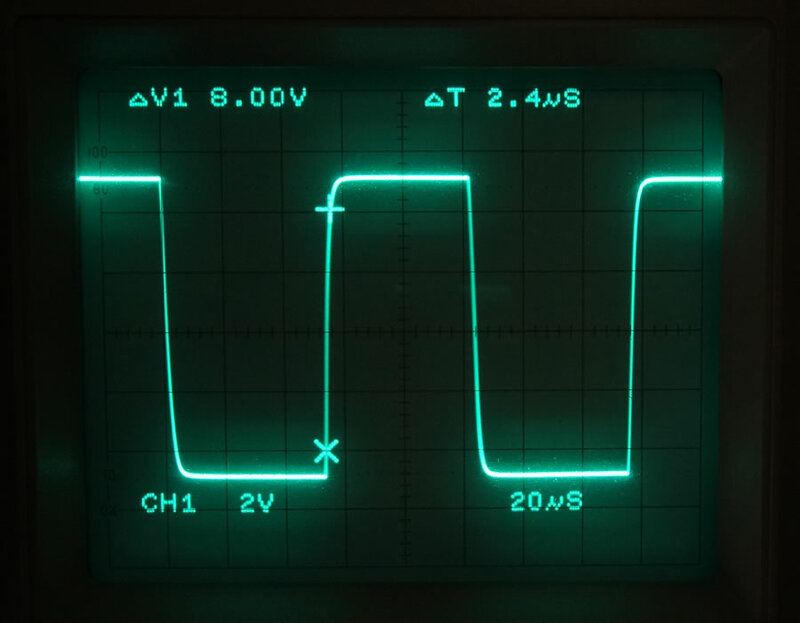 The oscilloscope display is the full power of the Hx200mk2 with my bench power transformer secondary adjusted for 49-0-49V. 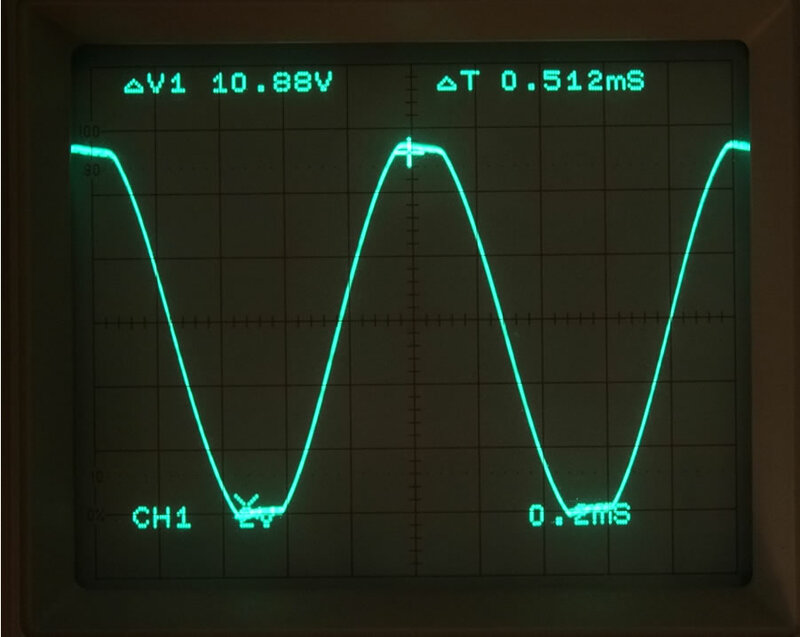 The test signal is 1kHz Sine. It registered 108.8V peak to peak into my 250 Watts 8Ω dummy load. Beyond 108.8V, the Hx200mk2 clips cleanly. This is roughly at 0.1% THD. Power output is into 8Ω dummy load. The Hx200mk2 10kHz Square Wave response is beautiful. There are no signs of instability. It has no overshoot on the leading and trailing edges. Top and bottom are perfectly flat. 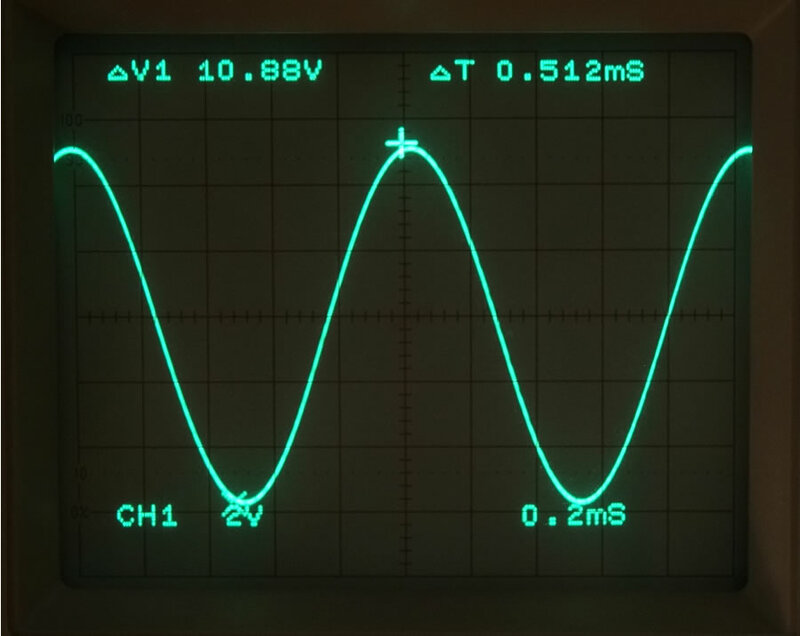 Amplitude is 10V peak to peak into 8Ω. Rise Time is recorded at 2.4 microsec. Now that the two Hx200mk2 modules are fully tested, the two heatsinks are re-assembled back with the L bracket. I have not attempted to remove the original circuit board because it will take up more of my time. Obviously, I disconnected all the electrical connections from the old board. I made two minor changes to the amplifier. The first is I replaced the input 1/4″ phone jacks with RCA. This is out of necessity because they were damaged. I also bypassed the passive volume pots on the front panel. This will improve the sound quality. 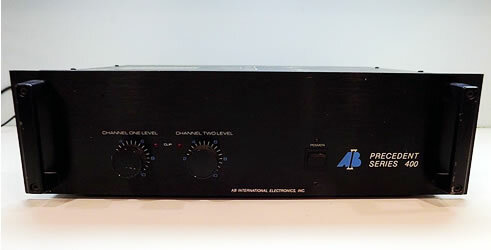 The AB International Precedent 400 is now like a new power amplifier. The only thing that I didn’t use is the original circuit board. 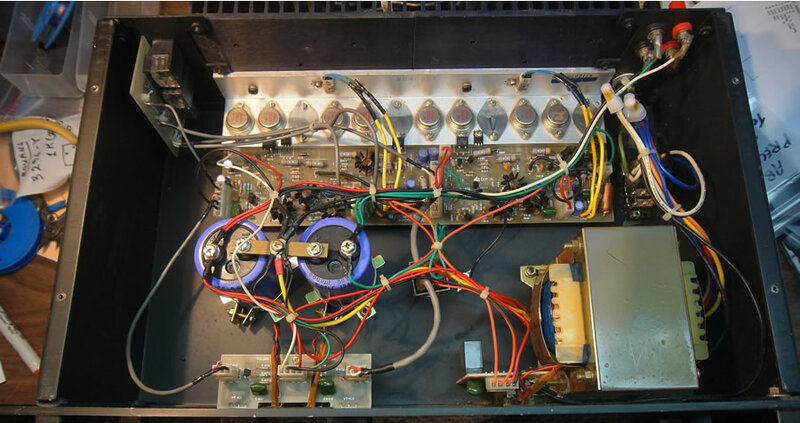 The chassis, power transformer, bridge rectifier and filter capacitors are all put back into service. Save time, save money and best of all, superior sound quality.